The Tyrant’s Forge Tier 1 20-man Raid for RIFT: Nightmare Tide has been out since the 4th February 2015. 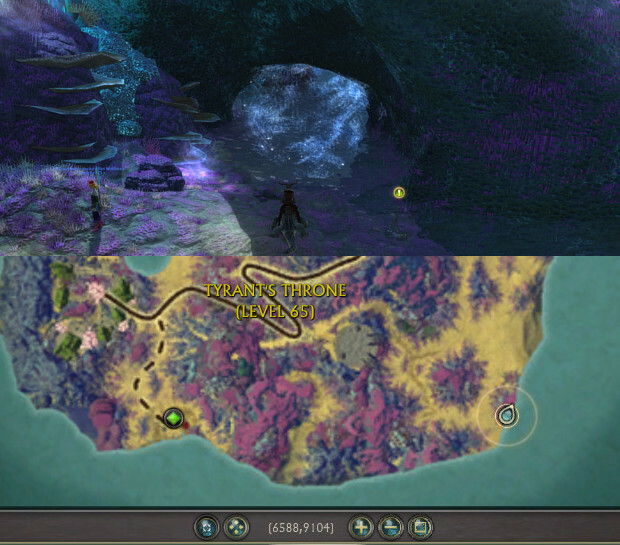 Entrance can be found at (6588, 9104) on Tyrant’s Throne. Check out some of the rankings and videos for each boss currently downed and congratulations to all those who have downed bosses in the second 20-man for the new expansion. Tier 1 20-man Tyrant’s Forge. The following sections will be updated as more information becomes available. Full Johan standings can be found at TopOfRift.com here. Johan Kill Video by RoughRaptors – Warrior Tank perspective. Direct Link. Gilgamesh’s Johan Kill – Mage Stormcaller Perspective. Trinity’s Johan Kill – Mage Chloromancer Perspective. Apotheosys’ Johan Kill – Cleric Tank Perspective. Stack on 8’s Johan Kill – Cleric Inquisitor (Ranged DPS) Perspective. Fires of Heaven’ Johan Kill – Cleric Purifier (Heal) Perspective. Full PUMPKIN standings can be found at TopOfRift.com here. PUMPKIN Kill Video by RoughRaptors – Warrior Tanking perspective. Direct Link. Trinity’s PUMPKIN Kill – Mage Chloromancer Perspective. Apotheosys’ PUMPKIN Kill – Cleric Tank Perspective. Fires of Heaven vs PUMPKIN Kill – Cleric Purifier (Heal) Perspective. Full Mechanical Tyrant standings can be found at TopOfRift.com here. Mechanical Tyrant Kill Video by Oria Xu – Cleric Tank Perspective. Direct Link. Rekt’s Mechanical Tyrant Kill – Warrior Tanking Perspective. Trinity’s Mechanical Tyrant Kill – Mage Healing Perspective. Fires of Heaven’s Mechanical Tyrant Kill – Cleric Healing (Purifier) Perspective. Khalim’na’s Mechanical Tyrant Kill – Mage DPS and Warrior Beastmaster Perspectives. Stack on 8 Mechanical Tyrant Kill – Cleric DPS Perspective. Arm Dearg Mechanical Tyrant Kill – Cleric Healing (Purifier) Perspective. Beep Beep Ima Jeep Mechanical Tyrant Kill – Cleric Healing (Purifier) Perspective. Mechanical Tyrant (Hard Mode) Kill Video by Yobiraion – Cleric Heal (Purifier) Perspective. Direct Link. Congratulations to all guilds who have downed the bosses of Tyrant’s Forge! Could you fix the error on this page? Hey Konn! Sure thing, and grats on the kill! Here is “Crucia HM” kill video by Apotheosys!